Prisoners in Acre, northern region of Brazil, where the military police is responsible for the prison security | Photo: Luiz Silveira/Agência CNJ. Used with permission. Imagine sharing a room with 40 other people in a space made for 12. Imagine having to hang your mattress close to the ceiling because the sewage system often clogs and floods the room with dirty water up to 40 centimeters high. The place is so filthy that your skin breaks out in a rash that will soon worsen into a festering wound. Diseases such as AIDS and tuberculosis spread like epidemics, but if you get really sick, only one type of medicine will be prescribed, no matter your symptoms. And you might not even have been convicted to a crime. It could be years before before you get a hearing, let alone a trial and a court sentence. This is life in Brazilian prisons. Brazil's prison population grew 400 per cent  in the past 20 years, when its actual population increased by only 36 per cent in the same period. That's a yearly surplus of 40,000 of people . Brazil's large prison population ranks it fourth in the world, only behind the United States, China and Russia. 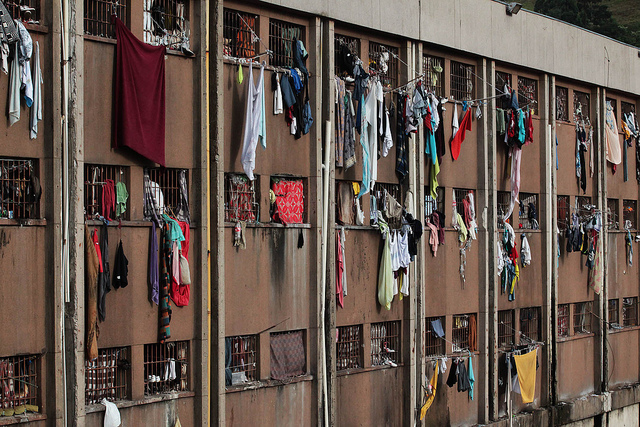 All of Brazil's 27 states  have more people in prison than they have slots available. According to the National Council of Justice , as of February 2017 there were over 600,000 people incarcerated in Brazil. Among them, more than 220,000 are still awaiting trial — that waiting period varies between 172 and 974 days. The overcrowding, the health crisis , and the torture  that some detainees experience have also increased the power of gangs, criminal factions and druglords that use prisons as their actual headquarters. A group of Brazilian human rights advocacy NGOs recently launched a campaign to call attention to all this. The Network of Criminal Justice (Rede de Justiça Criminal) created a 360º video showing what it's like to live in a overcrowded prison cell in Brazil, and in three days it reached more than 9 million views and 55,000 shares on Facebook (and a considerable amount of both positive and negative reactions). The cell featured in the video isn’t real. But the man hosting the viewer through it, Emerson , did endure life in prison for four and a half years, sharing a nine-square-meter cell with 40 other men. Mass incarceration is not only inhumane, but also against the law. There are thousands of people in prison without a sentence, because of flaws in the Brazilian legal system. The campaign's message is that there is little room for social reintegration when a person loses rights and dignity. In Brazil, a common saying is that prisons are merely “crime schools”. This perception is so widespread that it has been said by three very different people recently: the president of the Supreme Court ; a former minister of justice ; and a goalkeeper  convicted of killing his ex-girlfriend and feeding the corpse to his dogs, who's been in prison for six and a half years now (not counting a brief release  earlier in 2017). What's drug law got to do with it? Prisoners wait in a Brazilian prison unity. Photo: Luiz Silveira/Agência CNJ. Used with permission. For Human Rights Watch , the main reason driving the growing prison population is Brazil's drug law, sanctioned in 2006 by then President Luís Inácio Lula da Silva. While that law decriminalized drug use, the text does not offer clear definitions of what differentiates “use” and “trafficking,” leaving police officers and judges to decide on a case-by-case basis. The consequence has been that even more people have been convicted of trafficking. Today, one in every three prisoners  in Brazil is in on drug-related charges. It used to be just 8.7 per cent of all convictions in 2005; in 2017, it's 32.6 per cent. In the case of female prisoners specifically, it is even worse: close to 70 per cent of all convictions . In comparison, only 12 per cent of people now in prison were put there on murder charges, and that's in a country where, between 2011 and 2015, there were 278,839 homicides. That's more than in Syria  during the same period. The Central Prison, in the south of Brazil, was once categorized as the worst one in the country | Foto: Luiz Silveira/Agência CNJ. Used with permission. A 2014 study by the Prison Information report (Infopen)  shows that 96.3 per cent of all Brazilian inmates are male, 67 per cent are black and 53 per cent only studied up to primary school. Only 1 per cent have a college degree, and another 1 per cent went to college but didn't graduate. 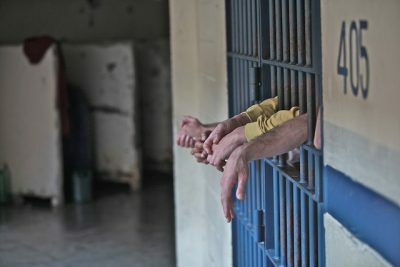 Brazil is country that jails black, young, male and poor people, but prison isn't exactly helping them or society: another study  by the Institute of Applied Research and Statistics (Ipea) reveals a 30 per cent rate of repeat offense. The more you jail, the more you increase in sentencing, the more criminal rates in the country grow alarmingly […] The answers given so far to issues of violence have been highly wrong, generating an even greater backlash of violence for Brazilian society. The Conectas campaign is yet another attempt to raise awareness of the dire conditions of the Brazilian prison system. Note: An earlier version of this story incorrectly stated that the 360º video was produced by NGO Conectas. It was produced by the Network of Criminal Justice, of which Conectas is a member.